...inspired by my tortoiseshell cat, Catzee. The write up includes a black and white photo of a sample and the draft. An Unexpected Wrinkle - How I came to name it "Tortie Trails" and the problem I had with wet finishing it. Of course it's an honor to be "published," even if it's only as a contributing member of a study group. But this sample is special to me because of Catzee. She disappeared at the end of last August. In spite of turning the world upside down to find her, we never did, nor have a clue as to what happened. I have grieved over her more than I ever have any other cat. I still have to catch myself, and not allow the sadness to overwhelm me again, by focusing on happier thoughts. Anyway, I just wanted to share this with you. I learned a lot by participating in the study group, and plan to do another someday, whenever we finally get settled and establish a routine on the homestead. Even though this blog isn't very active, I still appreciate every one of you who visits, especially those of you who are regulars and visit my homestead blog too! Thank you! 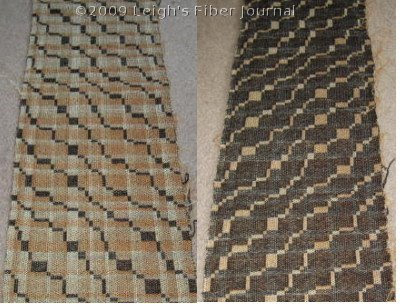 "Catzee's Cloth" Made the Complex Weavers Journal photos and text are © 7 March 2010 by Leigh at Leigh's Fiber Journal. That's sad and unsettling about Catzee. I'm sorry that she left your life in that way. Now I'm kicking myself for not joining Complex Weavers in time for this issue. I keep meaning to join! I saw it! Great that you are in print. Congratulations! What a fine tribute to Catzee. I know she's greatly missed by all. That is such a lovely picture of Catzee. The cloth is nearly as beautiful as she is, and just perfect colours. Congratulations on getting into the pages of the Complex Weavers magazine. I'm not a member, and feel I miss out especially when people mention the magazine. Congratulations, that's fantastic, and you've really deserved it! Catzees cloth is beautiful! Congratulations - that's wonderful. A stunning pattern and a fine tribute to your beloved cat. I feel so bad about Catzee. I can understand why she weighs heavy on your heart. Every time I look at our "foundling" cat I'm so happy we took her in. Maybe its the other way around - she took us in. Either way it's a good match and would be lost without her. Yes, I saw this. Congratulations! Does this inspire to get back to your loom sooner than later............hope, hope, hope...............? Congratulations on being published! The cloth is wonderful and I can't think of a nicer tribute to Catzee. There are two cats in my life that I have never stopped missing and I know Tina continues to mourn Neelix. Congratulations, Leigh! Actually, I think you should have been published long before this. And we still miss Catzee, too. This pattern will live on as a testament to a wonderful purrson in your life. I'm so sorry about Catzee I'd hope she'd come back to you. 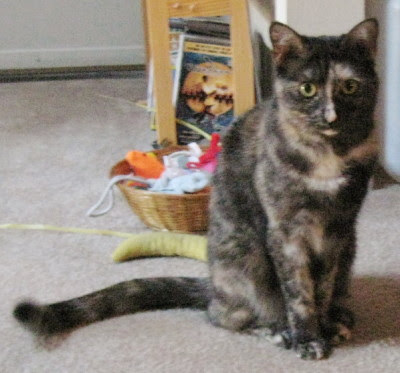 Must be something with tortoiseshell cats - your Catzee could be a double for my InaMay and she disappeared one day too. Beautiful weaving to remember her by.